Members of the Liam Doherty’s lemonade crew pose for a photo along with Jess Kaplan, MD (upper right), on the day of Liam's fundraiser for Crohn's disease research. Aiming to turn his own experience with Crohn's disease into a positive, Liam Doherty launched a campaign to support Mass General research into the disease. Nine-year-old Canton, Massachusetts, resident Liam Doherty, an energetic, active third grader who loves his grandmother’s cookies and playing sports, recently learned some important life lessons. Early this past summer, Liam experienced some struggles with his health, which affected his general outlook. The health issues were not new. When he was in kindergarten, Liam’s parents, Lauren and Russ, learned that he has Crohn’s disease, an autoimmune and IBD-related condition that can affect the body in a variety of ways but primarily impacts the gastrointestinal tract. Luckily, Liam’s Crohn’s is mostly quite manageable. But Liam had started seeing his Crohn’s from a more mature perspective. “It was the first time it dawned on him it was forever,” said his mother. Liam Doherty, pictured with his doctor, Jess Kaplan, MD, visited Mass General recently to present a donation of more than $3,000. From being quite open about his condition, the normally resilient Liam became very private; worse, his mood was low. Lauren and Russ talked to him about looking for ways to turn the experience into something positive and how when life gives you lemons, you have to make lemonade. 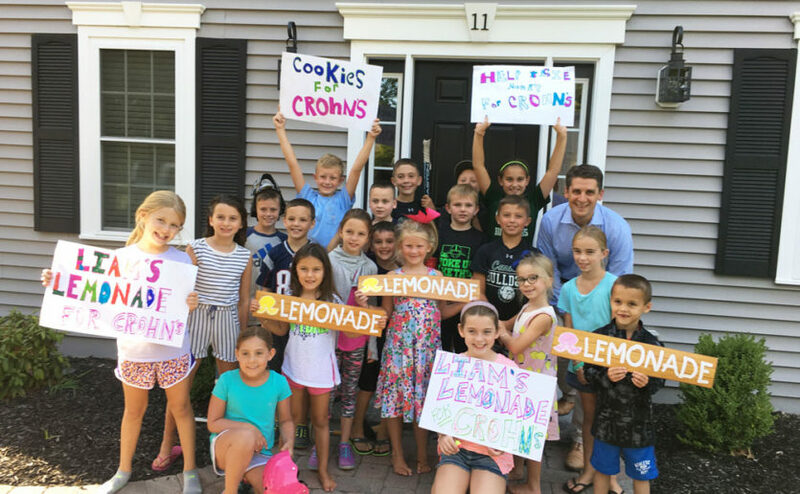 She didn’t immediately understand that he was being literal: he wanted to have a lemonade stand and raise money for Crohn’s. She agreed they would do it later in the summer, and they mentioned the idea to Liam’s “very caring” doctor Jess Kaplan, MD, a pediatric gastroenterologist at MassGeneral Hospital for Children (MGHfC). Weeks passed for the busy family (including siblings Rose, 6, and Patrick, 2), and on Aug. 30, 2017, Liam reminded his mother that they still had to do the lemonade stand. They set the date for Sept. 1 and decided that they would also be collecting new socks, underwear and t-shirts for Houston victims of Hurricane Harvey. Liam asked Lauren to post it on Facebook. She emailed Dr. Kaplan but assumed he would be too busy so close to Labor Day to get involved. Liam made signs and persuaded his grandmother to bake cookies for the sale. He also decided on prices: 50 cents for lemonade and $2 for three of Nana’s cookies. On the day of the sale, Liam worked on making lemonade and setting up; he also took on cash register duty. He was joined by cousins and some friends. Lauren said the group was so excited that they opened the stand for business ahead of the scheduled 2 p.m. opening. Liam offered lemonade to passers-by, including the mailman. To date, the lemonade stand has collected more than $3,000, which has been given directly to IBD/Crohn’s research at MGHfC. Liam recently visited the hospital to present his check. He also filled three bins with clothing for Hurricane Harvey victims. So besides learning a lot about lemonade, Liam has seen for himself just how supportive and generous people can be. To donate to Liam’s lemonade stand, please visit his fundraising page. This story was originally published by The Canton Citizen. Your donation supports health care and medical research for children.